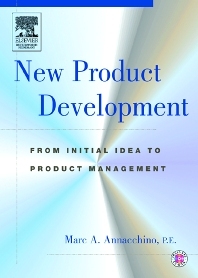 This comprehensive and detailed book is a practical guide to the process of New Product Development from initial concept and corporate goals assessment through marketing, planning, development, manufacturing and product management. It contains over 200 illustrations with 52 actual tools needed to execute an actual program. On the accompanying CD-ROM version, these tools are embedded in the text for presentation to the reader. Embedded hyperlinks allow the reader to jump to a special "sandbox" which will allow them to apply the concepts presented in the text directly to their development program and save them as part of their filing system, providing the actual framework for practitioner use. Industrial managers, product engineers, development engineers, design and manufacturing. Graduate students enrolled in product development or industrial management programs or courses. Executives involved with overseeing new product development. Marc A. Annacchino, P.E. is a general management executive with over 30 years experience in the field of Sales, Marketing, New Product Development, Manufacturing Operations, Quality, Accounting and Finance. He is Owner of Marconi Product Development Institute, Inc. a firm that assists organizations in the area of contract product development and business development. He is also the director of the Business Excellence Consortium at Milwaukee School of Engineering: an outreach arm of the University that assists companies in their journey to world competitive performance.